RSVP for complimentary cocktails tonight from 8 p.m. to 9 p.m. HERE. 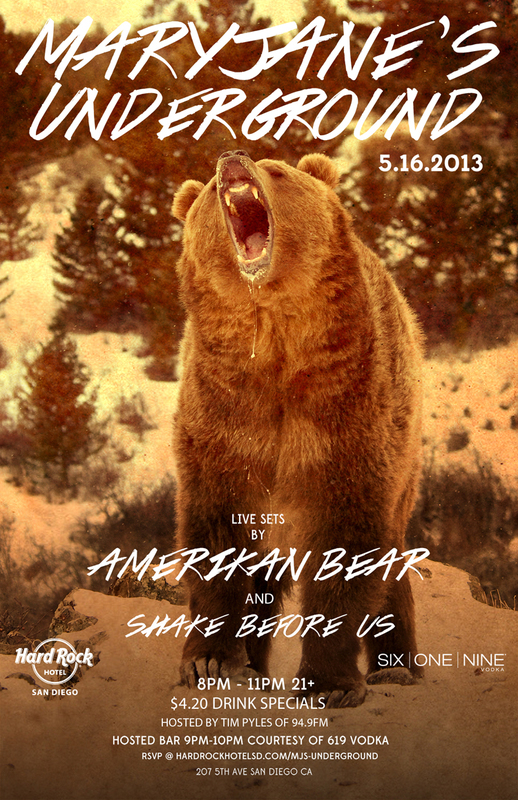 Music starts at 9 p.m. with Shake Before Us, then Amerikan Bear at 10 p.m. The night is free, but RSVP for the sponsored hour courtesy of 619 Vodka. Maryjane’s Underground is a monthly live music event showcasing the best up-and-coming talent that San Diego has to offer. Hosted by San Diego radio legend and local music guru Tim Pyles, MJ’s Underground features music of all genres, $4.20 drink specials and there is NEVER a cover charge. So if you’re in to small venues where you’re up close and personal with the band, and appreciate a cheap drink or two (or three), then this night is for you.